UNIVERSAL ARTICULATING WALL MOUNT (LARGE). 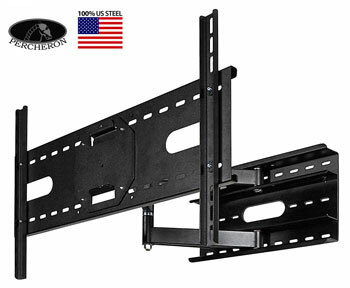 Adjusts to fit most 30" to 52" LCD or Plasma TV's and monitors with VESA bolt pettern of 730mmx480mm. Single articulating arm pushes flat into wall plate and extends 30" max. "Bank Vault" bearings assure smooth swing action (lifetime guarantee on bearings). Flat-panel tilts -5°/+15° and mounts in portrait or landscape configuration. 150 lbs Recommended Max Load.